If you thought that the extreme medical treatments involving urine, heroin and cigarette smoking were unbelievable, wait until you read this follow-up piece… except that one of the cures is still being used. Actually used by the comedian, Andy Kaufmann in 1984, as a treatment for lung cancer, psychic surgery first came on the scene in the 1940s and 50s in Brazil and the Philippines. Self-proclaimed healers often appear to remove ugly black leaves and other gruesome objects from the bodies of the ill. While slight of hand is generally used to create the effect of spiritual intervention, the theoretical premise is that these objects were implanted as the result of dark magic or sorcery. These cases of psychic surgery center around healers whose talents are said to be guided by powerful spirits. Operations are performed without the benefit of anesthesia or antisepsis, under unsterile conditions, often without even the benefit of a knife. Blood appears. Tissue is removed. And yet, when the procedure is completed there is often no trace of a wound or an opening. 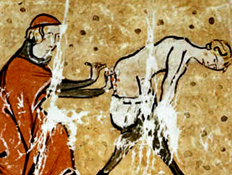 Medieval physicians used cautery irons to treat the problem. Read more. Maggots have been known for centuries to help heal wounds. 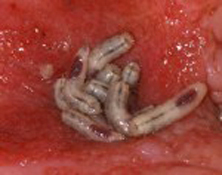 Military surgeons noted that soldiers whose wounds became infested with maggots had better outcomes than those not infested. William Baer, while at Johns Hopkins University in the 1920s may have been the first in the Northern Hemisphere to have intentionally applied larvae to wounds in order to induce wound healing. 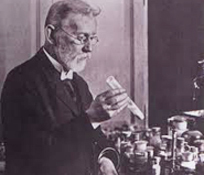 Until the early 1900s, there was no treatment for the sexually transmitted disease (STD) when Viennese neurologist Wagner-Jauregg had the idea to treat syphilis patients with malaria-infected blood. The patients would then develop malaria, which would cause an extremely high fever that would destroy the syphilis bacteria. When that happened, they would be treated with the malaria drug quinine and cured of both ailments. Of course, there were the side effects–such as the high fever, but they were worth the outcome, especially without any other options. Wagner-Jauregg even won the Nobel Prize for malaria inoculation in 1927, and the treatment was common until the development of penicillin came along and doctors had a safer and more efficient cure for the STD. This week we are featuring some great deals on ultrasounds. Aloka SSD 500 ultrasound (pre-owned) Click here to make an offer. Applications include general abdominal, obs/gynae & surgical; convex sector/inear scanner; outstanding image quality; extensive measurement & calculation package; annotation function with full alpha-numeric keyboard. Read more. Aloka Alpha 7 ultrasound (pre-owned) Click here to make an offer. Broadband harmonics imaging; reduced side lobes and multiple echoes; higher penetration in deeper areas; directional eFLOW; enhanced spatial and time resolutions. Read more. 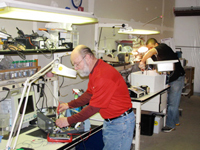 Aloka SSD 1000 ultrasound (pre-owned) Click here to make an offer. Employs super high-density transducers; convex sector & linear scanning as standard; dynamic frequency scanning; swivel operation panel and monitor; ABC (Automatic B-gain Control). Read more.